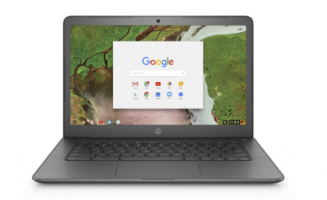 HP Chromebook 14A G5 Education Edition Convertible Laptop comes with Chrome OS Operating System, AMD A6-9220C APU APU processor ticking at with Radeon R5 Graphics (1.8 GHz base clock, up to 2.7 GHz max boost clock, 1 MB cache, 2 cores) clock rate, 4GB DDR4 1866Mhz Memory and 16GB up to 64GB eMMC SSD Solid State drive internal storage. HP Chromebook 14A G5 Education Edition Convertible Laptop also has DTS Sound,Integrated stereo speakers, HP True Vision web cam, Microphone, Full-size textured island-style keyboard, spill-resistant, pick resistant and optional backlit. The Laptop has 14.0 inch screen size, 33.7 x 22.6 x 1.83 cm (W x D x H) Physical Dimension and 1.57 kg Weight and 2-cell 47.36Whr Li-ion polymer battery.